I start off with a new concept and the intelligent part of me says sample to make sure you are on the right track. Then, days or perhaps weeks later, as happened this time, I finally stop sampling; get focused and get back on track using little of the information I gleamed from sampling. I know I do this...and yet I keep doing it...leaving so much less time to work on designing the layers of meaning in my piece, which is by far my favorite part. I am incredible excited about a concept I have for a new series of pieces. I started planning backwards this time since I wanted to make sure it would be easy to finish and be exhibit quality. First I bought the frames and planned how to finish the piece...next I bought two potential linens for the warp and weft with the texture I wanted...then I chose the weaving structure which would do what I wanted it to do.... At this point I saw the piece so very clearly in my mind. Ah, now the intelligent part of me said...best to sample to make sure you get the right sett, warp and pattern. And in the end, I chose to use cotton seine as my warp and weft, which I did not sample. A set of 10 epi which I did not sample. And moved to a table loom instead of the floor loom where I did do all those samples. 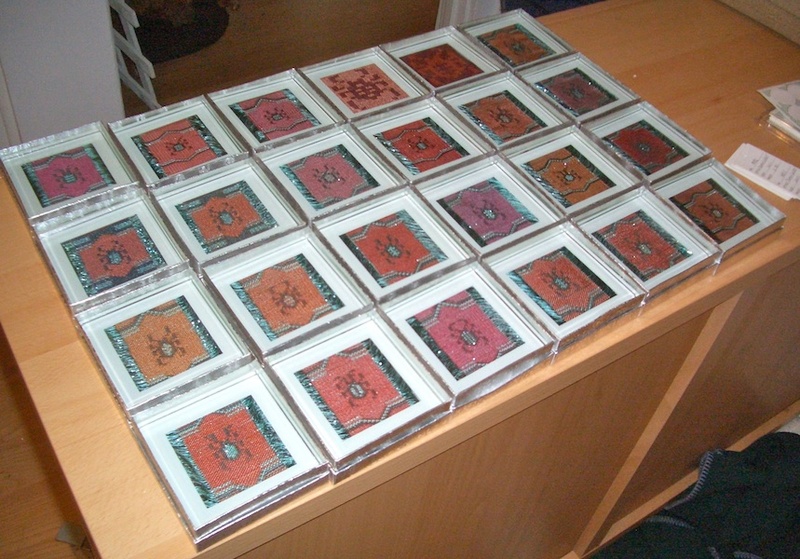 Just finished signing, buffing and boxing my beetle coasters for 2011. I have two dozen ready for sale for the holiday season. Each beetle is a variation of my favorite beetle pattern; all done in colors of the southwest. This is my second year of doing these; and hope to do a different set next year. I spent a great deal of time getting them 'just right' and now I know I will have a tough time offering them for sale...I would love to keep them all! Each is beautiful as well as useful plus with their own box they are 'no brainer' holiday gifts. Expect them to climb out of their boxes and be ready for viewing the weekend prior to Thanksgiving... here.